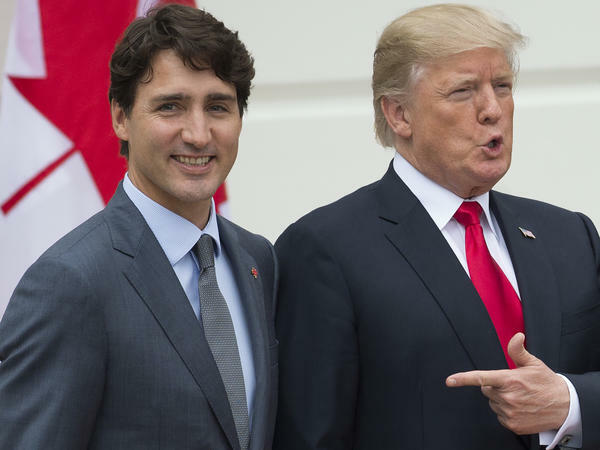 Canadian Prime Minister Justin Trudeau (seen here with President Trump in October) on Thursday called the argument that U.S. steel import tariffs were necessary for national security reasons an "affront" to Canada. Commerce Secretary Wilbur Ross said Thursday that the U.S. will impose tariffs of 25 percent on steel and 10 percent on aluminum for imports from the European Union, Canada and Mexico just after midnight on Friday. Europe, along with Canada and Mexico had been granted a temporary reprieve since President Trump first announced the tariffs in March. The administration is taking the action under a relatively obscure U.S. trade law intended to protect national security. Many prominent Republicans have criticized the administration's aggressive use of that justification, saying its trade actions will hurt the U.S. economy. The EU threatened to make good on a threat it issued in March to impose tariffs on imports from the U.S. that is 10 pages long, including everything from corn and tobacco, to T-shirts, Levi's jeans, bourbon, motor boats and various forms of steel. The EU also started the process of filing a complaint with the World Trade Organization. In a statement, European Commission President Jean-Claude Juncker said "this is protectionism, pure and simple." Trade Commissioner Cecilia Malmstrom added that the U.S., through months of negotiations, threatened steep tariffs in order to obtain trade concessions from the EU. "This is not the way we do business, and certainly not between longstanding partners, friends and allies," she said in a statement. Mexico's ministry of economy pledged to impose equivalent measures, and included a partial list of U.S. goods that would face tariffs, including pork bellies, cheese, and produce such as grapes and apples. A list of countermeasures would include tariffs on U.S. metals and food products such as yogurt, pizza and cucumbers, as well as household products like mattresses and refrigerators. Canadian Prime Minister Justin Trudeau said the Trump administration's argument that the tariffs were necessary for national security reasons was an "affront" to Canada, which has fought alongside the U.S. in numerous armed conflicts. Britain issued a statement saying, in part: "We will defend the UK's interests robustly. We continue to work closely with our EU partners and will consider carefully the EU's proposals in response." The UK's Secretary of State for International Trade Liam Fox told Sky News it, too, is considering retaliatory measures and joining the EU's complaint with the WTO. As for the U.S.'s national security argument, Fox said, "In the case of the UK, we send steel to the US that is vital to their defence industry; it is patently absurd." Bruno Le Maire, France's minister of the economy and finance, said the U.S. tariffs are "unjustified, unjustifiable and dangerous." He told NPR's Audie Cornish: "We are close allies, we the Europeans, to the United States and we cannot understand that decision. We strongly believe that the decision taken today by the American administration is really an unacceptable one." "[French] President Macron expressed yesterday his willingness to work on the renewal of the trade system with the United States, but we cannot negotiate, we cannot enter into any kind of discussion, under pressure, and being hit by tariffs will not help us to open the door to any kind of negotiation," Le Maire said.